Sweet kitten begging for scraps. There are stray animals everywhere in Vietnam. Some of my favorite stories always circle back to Hoi An. This sleepy riverside town close to the coast of central Vietnam was one of our most memorable destinations. We spent a gorgeous 7 days and 6 nights in this small town that is famous for many reasons. It is a protected UNESCO site, for it’s uniquely untouched old town architecture that miraculously avoided destruction in the American War (or as we call it, the Vietnam War). 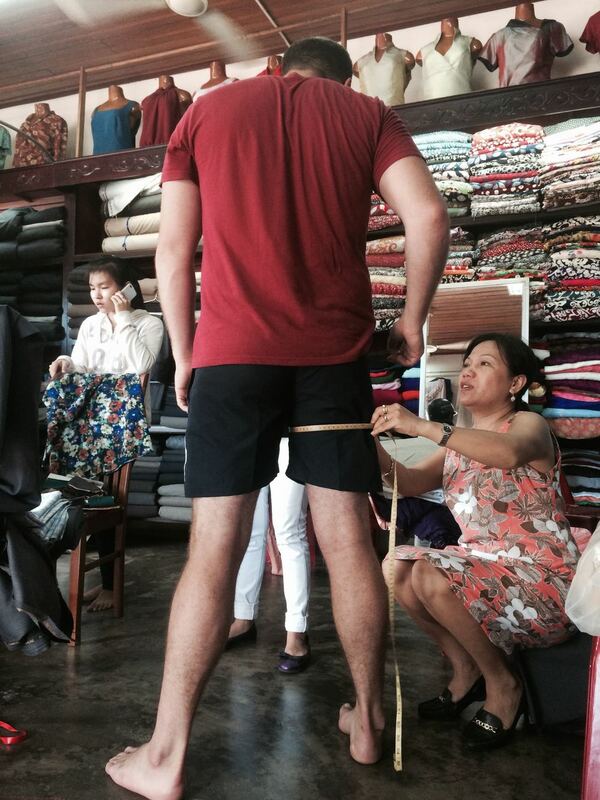 Hoi An is also famous for being the town with the highest ratio of tailors to denizens in the world. The food scene is unimaginably diverse and the quality of life versus price is pretty hard to beat. It seems common that when you arrange a home stay, you often get access to bicycles for free. We found our home stay on AirBnB and were quite pleased. This was such a lovely opportunity to engage with the town as a local would. No need to haggle with tuk-tuk drivers or taxis and no complicated traffic patterns to negotiate. We happily pedaled the city day and night, through rainstorms and starry skies. The weather was warm when we were there in November. They consider it the dry season and it is also the coolest time of year, but for me 80°F was still plenty warm. Led by students eager to practice their English skills, you hop on your bike and take a leisurely cruise through the different artisan villages surrounding the more touristy center of Hoi An. The country side was so worth the ride alone. We visited wood carvers, boat makers, mat weavers. 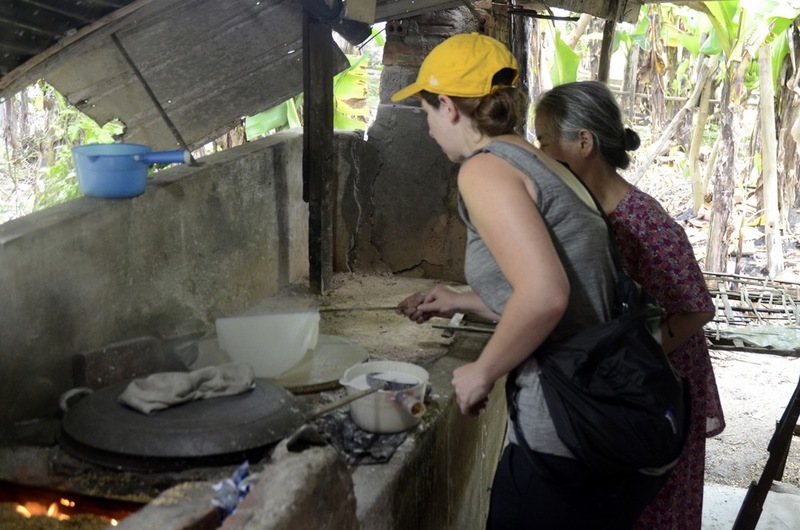 We had little old ladies teach us how rice paper was made, I learned that it is not as easy as it looks, as most things are when you actually put your hand to it. We also got to chat with our other tour members and found that the company was very agreeable. The total cost of the “free tour” amounts to $2.50 USD. The money covers the ferry ride for you and your bike and small community donations. It takes up about 4.5 hours and was one of the best tours we took the entire trip. A fantastic feast that we were invited to partake in at our homestay. This was one of 4 tables piled so high with food that the plates had to overlap just to fit. Some of my best meals I can recall were eaten in Hoi An. The spectacular range of local dishes coupled with the uncanny ability the Vietnamese have for grilling meat just sent me over the moon. The high reliance on fresh herbs and rice paper was right up my ally. Hoi An is known for a few specific dishes, Cau Lau, the "White Rose", Bahn Xeo, and others. There are "high end" options available at tourist prices or you can go down to the local market and eat with the natives in a more cafeteria like setting. We were on a budget and were not afraid of a few cockroaches so we ventured into the market. The food was delicious, friendly, and came with a side of haggling which always brightens up the day. One of our favorite meals was shared with some new friends. We chatted while drinking cases of Biere Larue and eating plate after plate of heavenly grilled ribs as the skies dumped rain in energetic yet irregular bouts. 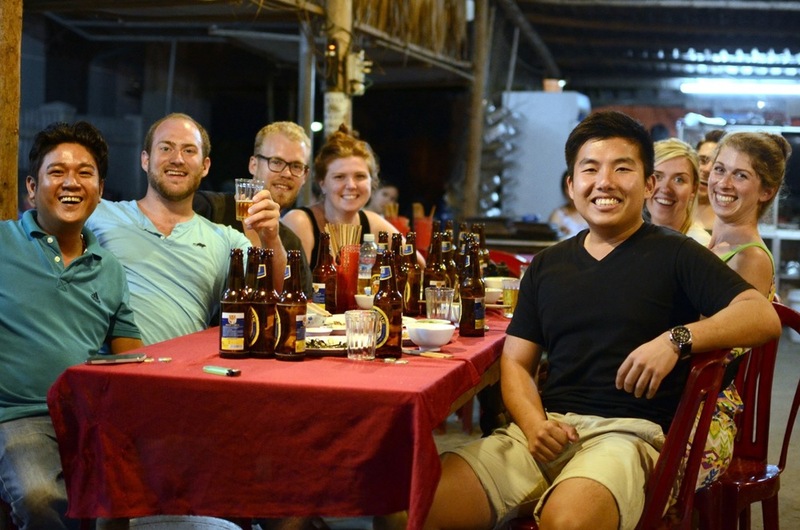 The beer in Vietnam and most south east Asia is served at room temperature. Upon request you are given ice to add to your glass. The beers are not particularly remarkable and are possibly enhanced by the addition. 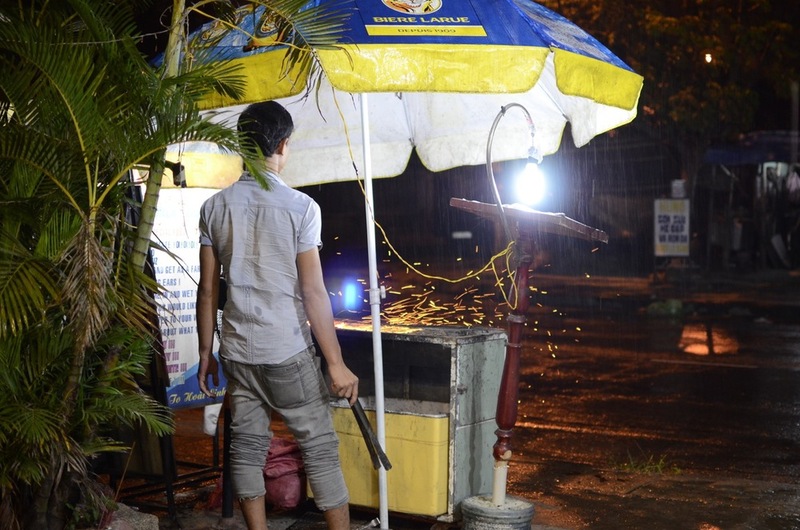 The rain can't stop this guy from grilling. BEST RIBS of my life. Great dinner party with our new friends from the bicycle tour. Andrew did the hard legwork of finding the tailor he wanted to use for his bespoke suit. There are hundreds to choose between and with an accidental misspelling, you could be getting a poor fit and a high price. Many shops will copy the names of popular and well established tailors. This confuses the traveler and muddies the reputation of all. BE CAREFUL when choosing your spot. Trip Advisor is wonderful but always trust your gut. Tailor’s are like therapists. You will be spending a good bit of time with them. It’s better if you like each other. We knew that we would be getting a suit made so Andrew was ready to answer questions about lapel width, cuff style, and pocket cut. There are myriad patterns and fashion magazines to inform you if you are not so clear on what you really want. The prices are amazing and the turn around time is a bit shocking. We ordered our suit at noon and it was ready for a fitting that evening around 7pm. The more you order, the better the price so it pay’s to find one tailor and give them all of your business. Additionally, the more reputable shops keep your measurements on hand for several years. You can call and have suits created and mailed to you for years to come (assuming your dimensions remain similar). 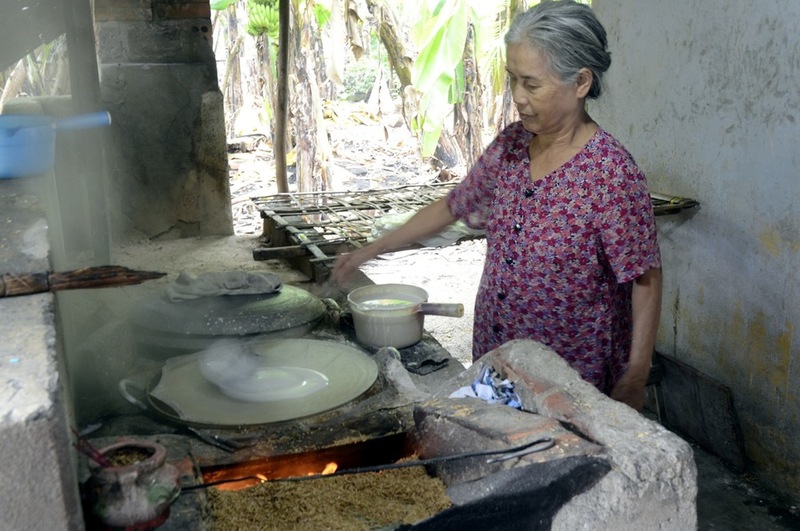 Hoi An is also host to countless cooking schools and classes. We love Vietnamese food and the desire to replicate the tasty dishes once we returned was a driving force in enrolling in one. We opted to include a trip to the market and were so glad we did. Our guide/teacher was a tiny young woman with an incredible depth of knowledge and incredible English. We spent two hours going through the local market and discussing the qualities of every ingredient we would need for the three dishes we had preselected. As two professionals with 20+ years of food experience between us, this seemed like it would be tedious, but instead was a revelation. She went in depth about cultural preferences, how to spot fake turmeric, and how to choose a proper pineapple, among many, many other things. We were taught at her restaurant which was located a bit out of town in a village that provides the herbs for the area. We got to walk, talk, and taste them all as we toured. She named each one while we got to taste it. It was such a revelation. So often, we had been eating so many strange dishes on faith. It was so nice to have somebody explain which herbs were often added to what dishes. We loved the portion of the class were we each got to cook as well. It felt nice to have a knife in hand and smell the garlic heating up. There are not a lot of opportunities to cook when you are traveling. It was an additional pleasure. The experience was perfect, our teacher was kind enough to email us the recipes we had chosen as well. The total cost came to about $20 USD per person. An incredible value in my opinion. I will share my attempts at recreating our tasty dishes in another post.